The program that we created in the first chapter will serve as the basis for the code in this chapter, so simply copy the file chapter.1.c to a new file called chapter.2.1.c, open it up in your editor, and let's get started. All solid geometry in OpenGL is composed of triangles, so it is only natural that the first object we draw is a triangle. As in the first chapter, if you don't understand everything while you're copying the code, don't worry, since we'll explore what happens in-depth in the next section. Since we're in chapter two of the book, change the WINDOW_TITLE_PREFIX pre-processor definition to reflect Chapter 2. The next function is CreateVBO, which creates the buffer objects and defines the buffer's contents. Add it right after the CleanUp function definition. We've added quite a bit of new code and many new OpenGL function calls that we haven't used before -- let's explore exactly what we've done. The first thing we did was change the title of the window that we created by modifying the WINDOW_TITLE_PREFIX pre-processor definition, so no big change there. Next, we declared a few new global variables to hold the identifiers created for the shaders and buffer objects that we'll be creating. While we will be discussing shaders in much detail in a future chapter, some basic knowledge of them is useful before we go any further. Shaders comes up frequently, whether it is in talks about graphics hardware or rendering software, the word "shader" is usually prevalent. In the context of OpenGL (as well as Direct3D), a shader is program that runs on the graphics hardware. 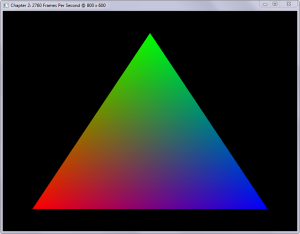 OpenGL expresses a shader program through a C-like programming language called the OpenGL Shading Language, or GLSL. In the code above, we've already created two GLSL programs, one for per-vertex processing, and one for per-fragment processing. A vertex shader operates on a per-vertex basis, modifying the vertex's attributes passed in. A fragment shader operates on a per-fragment, modifying the final color of a pixel. The first line of our vertex shader program is a GLSL pre-processor definition denoting which version of GLSL the program requires; in our case this is version 400, corresponding with GLSL version 4.00. The #version pre-processor definition is required to access the feature set associated with that specific GLSL version. If you don't provide it, the GLSL version will fall back to version 1.10; the last version of GLSL where the #version definition was not yet required. The next line is a bit more puzzling, but not too hard to understand. 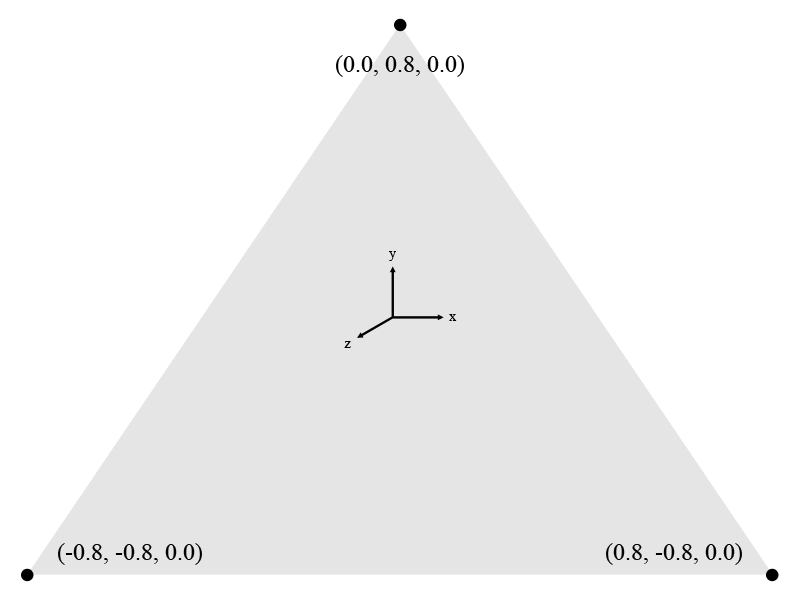 The name of the variable on this line is in_Position, containing the vertex's positional data stored in a four-dimensional vector, denoted by the vec4 data type. The keyword in defines that this is a parameter into this vertex shader, so we'll need to provide it through our OpenGL program. This is where the layout qualifier comes into play at the beginning of the line: layout(location=0). We'll discuss this coupling of GLSL and vertex information from our program in the walkthrough of the CreateVBO function below. The next line is almost the same as the line before, except that the variable's name is in_Color, and contains the vertex's color information stored in four color-channels using data type vec4. The next variable declaration is that of ex_Color, containing the final vertex color to be copied to the next shader stage. To denote that this variable is an output of our shader, we prefix it with the keyword out. The prefix ex_ is used in this book to denote a variable that is exchanged between different shaders. Much like a C-program, a GLSL shader program must contain a main entry function, but unlike C, the GLSL main function does not return anything and takes in no parameters. The main functions of the GLSL shaders in this chapter are simple for demonstration purposes; in subsequent chapters, we'll explore shaders that are more complex. The first line of our main function copies the value that we passed into in_Position into gl_Position, the final vertex position passed on to subsequent shader stages. You may have noticed that we don't declare gl_Position anywhere; this is because it is a built-in variable. Any transformation that you apply to gl_Position will reflect in your final rendering. For example, we will use this variable extensively in future chapters to relay the vertex's final position after we apply perspective projection calculations to the vertex. 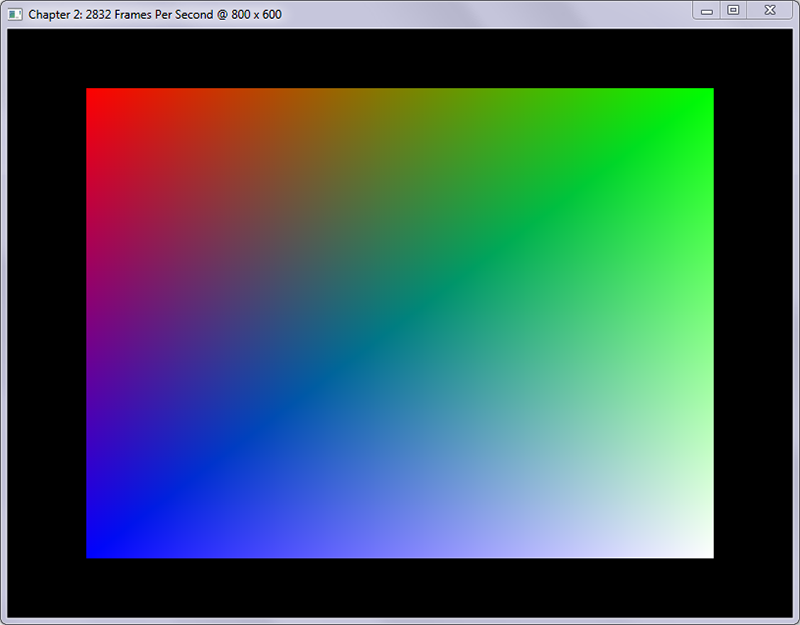 The ex_Color parameter is not an output in this shader, but an input instead. This is because we have copied the output variable of the same name from the vertex shader into the fragment shader. The fragment shader's only output parameter is the out_Color variable, containing the final color of the fragment that this shader processed. The final color assigned to out_Color is equal to the color passed into the ex_Color variable. We'll need some new functions for creating and destroying the buffer objects and shaders, so we declared five new functions. We also added calls to the CreateShaders and CreateVBO functions in the Initialize function definition, after OpenGL and GLEW were initialized. Since we're creating objects in this chapter, we need a method of destroying these objects properly as well. This is achieved by tying a function call back to glutCloseFunc, in our case, Cleanup, which calls both DestroyShaders and DestroyVBO. The Cleanup function is called by FreeGLUT right before the OpenGL context is destroyed, so we can do our resource cleanup correctly and without any problems. Since shaders are described in much detail in chapter four, we'll solely focus on the creation of the buffer objects in the CreateVBO function. W, our fourth dimension has nothing to do with physics, where time represents the fourth dimension, rather, it has everything to do with something called homogeneous coordinates which we'll explore when we cover three-dimensional geometry, matrices, and projection in a near future chapter. For now, make sure that the value of W is always 1.0, and take its purpose on faith until we describe it in more detail. Since vertices only define coordinates, we'll need to define another array containing RGBA color values. This array is called Colors and defines the colors for each of our vertices. Since RGBA colors have four components, and we need to color three vertices, our array contains twelve floating point values. In order, the colors we define in the array are Red (1.0, 0.0, 0.0, 1.0), Green (0.0, 1.0, 0.0, 1.0), and Blue (0.0, 0.0, 1.0, 1.0). The last value of an RGBA color is called Alpha, which controls the transparency of a given color where 0.0 equals 100% transparency, and 1.0 equals 100% opacity. Next, we define ErrorCheckValue, a variable we use at the end of the function for error checking purposes. The variable is initialized with the value returned by a call to glGetError, which retrieves the last error set by OpenGL. We call this function simply to un-set any errors that may have been set up to this point, but we discard the value returned by this call. Its first parameter n describes the amount, or number of Vertex Arrays to generate. After they are generated, their identifiers (or "names" in the OpenGL documentation) are stored in the arrays parameter, which must be an array of n elements. In our case, we only have a single Vertex Array Object, so we pass in the number one to n and the address of the VaoId variable. So what is a Vertex Array Object? A Vertex Array Object (or VAO) is an object that describes how the vertex attributes are stored in a Vertex Buffer Object (or VBO). This means that the VAO is not the actual object storing the vertex data, but the descriptor of the vertex data. Vertex attributes can be described by the glVertexAttribPointer function and its two sister functions glVertexAttribIPointer and glVertexAttribLPointer, the first of which we'll explore below. Its first parameter, n, is the number of buffers requested. Once n buffers have been generated, their identifiers (also referred to as "names" in the OpenGL documentation) are stored in the array buffers, the function's second parameter. buffers must be a GLuint array of n elements. In our case, we request one buffer to be generated, and its identifier stored in VboId. The generated buffers are of an undefined type until they are bound to a specific target. Not only does glBindBuffer bind the buffer to the specified target, it also activates the current buffer object as the target. This means that any buffer-related operations that involve the specified target will be executed on the buffer identified by the buffer parameter until another buffer is bound with a call to glBindBuffer. In our code, the buffer parameter is set to the value stored in VboId by glGenBuffers. The target parameter is once again set to GL_ARRAY_BUFFER to signify that we are copying data to the currently activated buffer with this target type, in our case the buffer identified by the value stored in VboId. The size parameter is set to the size in bytes of our Vertices array. As you can see from the function prototype above, the data is provided as a void pointer type through parameter data, which means that you can upload any data to the GPU's memory as long as you can provide their size. In our case, this data are an array of floating point numbers, but it could easily be an array of bytes, or an array of integers for that matter. The usage parameter is set to GL_STATIC_DRAW, which signified to OpenGL that the data uploaded to the memory will not be modified (static) and used for image generation purposes (draw). GL_STATIC_DRAW is not the only usage type that can be supplied to this function, and we will explore several other usage types during the course of the book, but for now, we're not modifying the triangle. glVertexAttribPointer provides OpenGL with all of the necessary metadata to use the block of raw data that we've uploaded to the GPU's memory using glBufferData. The first parameter that we provide to glVertexAttribPointer is index, which is a user-maintained number. This number is not generated by a function call of any kind, but must be maintained by you. As you can see, we're describing the in_Position variable with glVertexAttribPointer by having four floating point components, which corresponds to the definition of a vec4 datatype: "vec4 - a four-component floating-point vector." You can create many vertex attributes, as long as you keep their index values less than the value of GL_MAX_VERTEX_ATTRIBS. The next parameter is size, and unlike the size parameter that we used in our call to glBufferData, this one does not represent the size of the data in bytes, but rather the amount of components that make up a vertex. In our case, the size parameter is set to 4, signifying the X, Y, Z, and W components of our vertices. To calculate the size in bytes of each component, OpenGL needs to know the data-type of each component passed to the type parameter, in our case GL_FLOAT since each component is a floating point number. If the values in our vertex array were not floating point values but integer values, we'd have the option of normalizing the values to a certain range before using them by passing GL_TRUE into the normalized parameter. If the values provided were signed integers, the values would be normalized to the [-1, 1] range, and if they were unsigned, they would be normalized to the [0, 1] range. For example, if we'd pass in an unsigned byte with a value of 255, the resulting floating point value would be 1.0. In our program, the values passed are normalized floating point numbers so the value passed to normalized is GL_FALSE. Normalization is useful since it allows us to upload many types of data without having to worry about converting and clamping the supplied values ourselves. This is especially handy for color data, which are often represented as unsigned bytes or integers. It is possible to upload user-defined data structures using glBufferData, but OpenGL will have to know where the significant data in a structure ends and where the next starts. This is achieved by passing a value into the stride parameter, which signifies how many bytes are between the significant blocks of data. In our case this is zero since we use a packed array, but there are many cases where this could be useful. By utilizing the stride parameter, a single buffer object may be used for many different attributes by calling glVertexAttribPointer with different stride and pointer values. Last but not least, there is the pointer parameter. When the current target is set to GL_ARRAY_BUFFER, this parameter is a numerical offset in bytes in the block of data supplied in glBufferData to where the significant data starts. As with the stride parameter, this parameter is also important if the data you upload to the GPU's memory contains many values for different purposes (i.e. combining color and vertex data in a single data type). In our case, the stride and pointer parameters are both set to zero since the data we provide are sequential in nature. We explore the possibilities of the stride and pointer parameters in the last section of this chapter where we upload a custom data structure to the GPU's memory. When we're done providing vertex attributes, the attribute can be enabled with a call to glEnableVertexAttribArray and passing in the index also used as the first parameter in glVertexAttribPointer, this allows the vertex data to be used for drawing purposes. When you're done drawing the buffer object, a call to glDisableVertexAttribArray should be made. Since we're only drawing a single triangle in our program, the glEnableVertexAttribArray and glDisableVertexAttribArray calls are made in the CreateVBO and DestroyVBO functions, respectively. This means that the vertex attributes created in CreateVBO are enabled throughout the execution of the entire program; this would normally not be the case if there was more than a single object to draw. As you can deduce from the code sample, setting the color data is done in the exact same manner as setting the vertex data. In fact, the only difference is the buffer identifier passed to glBindBuffer, the data passed into the glBufferData function, and the vertex attribute index used. After the color data is set, we check if there were any errors by checking if an error flag was set by calling glGetError. If there was, we translate the value returned from this function with a call to gluErrorString, which returns the human-readable version of the code returned, and exit the program with an error code. Much like a C or C++ program, a GLSL shader program needs to be compiled and linked before it can be executed. This function copies the source code in the string specified by parameter string and associates it with the shader object identified by parameter shader, which is the identifier returned by glCreateShader, in our case VertexShaderId. The count parameter specifies how many strings are present in the string parameter, in our case this is 1 since VertexShader is one long string. The last parameter length is an array of integers denoting the lengths of the strings in the string parameter. You can usually leave this parameter at NULL if you use normal null-terminated strings, as in our case. This is a fairly straightforward function which takes in the shader's identifier as its shader parameter. Which takes in the shader program object's identifier and makes it current. The current program remains active until glUseProgram is called with another shader program object's identifier. The first parameter, mode, specifies the type of array data that's going to be drawn to the screen with this function call. In our case, this value is set to GL_TRIANGLES, but we'll soon explore some more options for this parameter. The second parameter, first, specifies the first index of the enabled vertex attribute arrays that we want to draw. The last parameter, count, specifies how many of the enabled indices to draw. 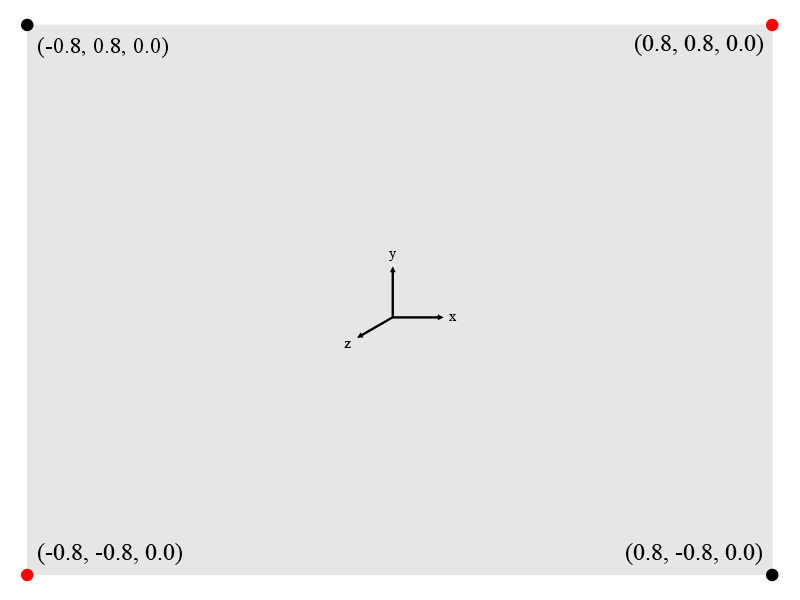 In our case these parameters are set to zero for first, signifying the index of the vertex position data, and three for count, signifying that there are three vertices to draw. After the program exits because of a user action, the CleanUp function is called by FreeGLUT to dispose of some of our generated objects. This function is the exact opposite of glAttachShader and expects the exact same parameters: *it takes in the identifier for the the shader program object in its program parameter and the identifier of the shader in the shader parameter. Which takes in the shader program object's identifier, in our case ProgramId. Now that you know how to properly create buffer objects and draw them, it's time to learn how to destroy them, so let's take a quick look at DestroyVBO. Much like in the CreateVBO function, we define an ErrorCheckValue variable and populate it by calling glGetError to clear any errors that were previously set by OpenGL. Next, we disable the vertex attributes that we enabled in CreateVBO in reverse order of creation by making two calls to glDisableVertexAttribArray with the appropriate indices provided. As you may have noticed, this call is similar to glGenBuffers since it takes in the exact same parameters, but does the exact opposite by deleting instead of generating. At this point, it is safe to exit the program, but first we check for errors with our familiar error checking setup. If an error is detected, write the error string to the command line and exit the program with an error code. In this section, we'll explore a few of the methods that we can use to define a rectangle in OpenGL. All of these methods use triangles as the fundamental building blocks for constructing the rectangle. The highlighted (red) coordinates signify vertices that are used in both triangles, but even though the same vertices appear in both triangles, each triangle has to redefine this vertex. This is the same for the color array, which also contains duplicate values since there is one color for each vertex. Adding more triangles this way doesn't take much modification, but causes unnecessary duplication of data when the triangles are consecutive in nature as ours are. The example above uses a method called triangle strips to construct geometry, which allows us to reuse vertices to construct new triangles. As you may have noticed, the rendered image is exactly the same as the one rendered with GL_TRIANGLES. 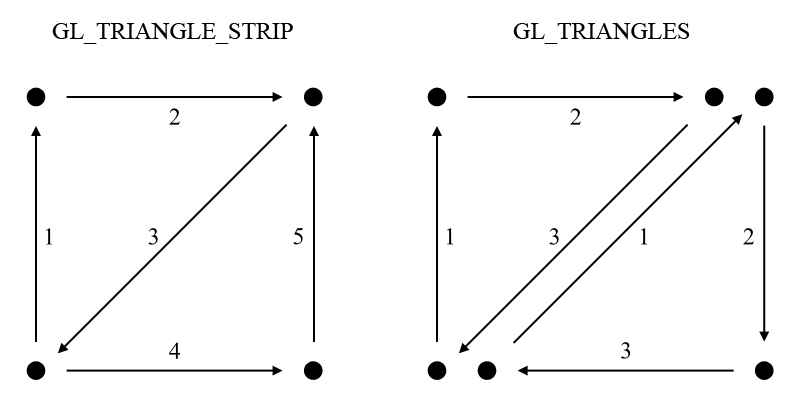 Both methods create an initial triangle, but the GL_TRIANGLE_STRIP mode simply adds one more vertex to create the next triangle, while the GL_TRIANGLES mode requires the creation of an entirely new triangle. The aim of this section is to show you how you can upload your own custom data structures to the GPU's memory and still access its data correctly. The main thing that you should take away from this section is that we no longer use two separate buffers for our vertices' color and position data. Instead, we utilize our user-defined structure Vertex and upload an array of those to the GPU's memory containing the same data as in the first exercise of this chapter. The structure itself contains two arrays of four floating point numbers, Vertex.XYZW representing the position data and Vertex.RGBA representing the color channels. We removed ColorBufferId and instead used BufferId for both the color and vertex buffers, since we no longer use multiple buffers to represent a single object. This becomes apparent in the CreateVBO function where we now call glGenBuffers asking only for a single buffer in return. The next major change is that we only call glBindBuffer once and bind both of the vertex attributes to this buffer. Next, we upload the entire Vertices array into the GPU's memory, containing our three instances of Vertex. As mentioned in the first exercise of this chapter, setting the stride and pointer parameters of the glVertexAttribPointer function allows us to pack many different data into a single buffer. By supplying these parameters, OpenGL can determine the position of the next block of memory it needs to use. The stride parameter defines the amount of bytes required to get from one vertex to the next, which is simply the size in bytes of our Vertex structure stored in the VertexSize constant. This value is the same for both attributes since they both operate on the same data structure. The pointer parameter is zero for the position-data, since it is the first array in our data structure and does not require an offset to access. The color data, however, does need an offset, which is set to the size of the Vertex.XYZW array in bytes since this is the block of data required to skip to get to the color data. Much of the functionality remained the same in this exercise, but most importantly, the format of the data changed significantly. We drew our first geometry onto the screen and learned many new things in this chapter, including how to construct basic geometry using buffer objects. Now that we have a basic understanding of buffers, shapes, and vertices, it's time to expand on our knowledge with array indices in the next chapter.